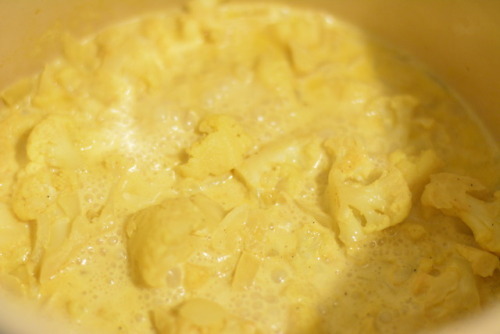 A really thick soup, this curry-cauliflower recipe from Grilled Cheese Kitchen, is a favorite of mine. Preheat the oven to 375F. Line a baking sheet with parchment paper or aluminum foil. In a large bowl, combine the cauliflower, olive oil, ½ tsp salt, and ½ tsp black pepper and toss to mix well. Spread the cauliflower in a single layer on the prepared baking sheet and bake until softened and lightly browned, about 20 minutes. Let cool on pan. In a small soup pot over medium-low heat, melt the butter. Add the onion and saute until soft and translucent, 5 to 7 minutes. Add the garlic and saute for 1 minute longer (do not let the garlic burn). Whisk the flour and cook for 1 minute, stirring constantly. Whisk in the milk, cream, and vegetable stock. Add the roasted cauliflower, curry powder, and cayenne pepper and stir to combine. Raise the heat to bring to a low boil, then turn the heat to low, cover, and simmer for about 15 minutes longer. Add the cheese and stir in one direction until the cheese is fully melted into the soup. Remove from the heat. Use an immersion blender to blend the soup into a smooth puree in the pot. If you don’t have an immersion blender, puree the soup in a blender, working in batches on low speed. Remove the plug from the lid, cover the lid with a clean towel, and hold down the lid while blending, or the hot soup will blow the lid off and make a mess in the kitchen. Taste and adjust the seasoning with salt and black pepper. Where am I supposed to get cauliflower from? Never seen it at normal grocery stores.... Is there some 1-day buying season that I don't know about?